It would be hard to imagine a more thrilling climax to a racing season. On the final weekend of the 2015 ADAC GT Masters at Hockenheim, the outcome of all three championships remains unresolved until Sunday. 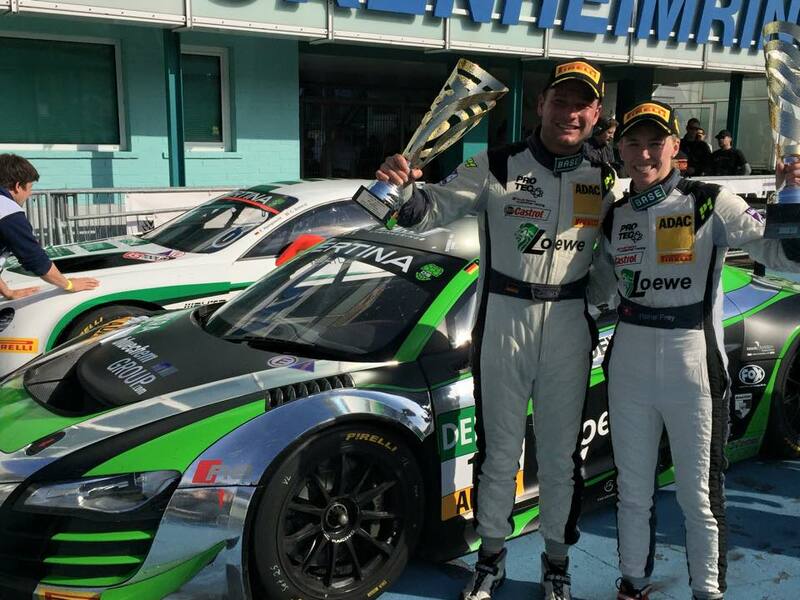 While the Audi R8 pair of Rahel Frey (29, CH) and Philip Geipel (28, DEU, both YACO Racing) were rejoicing at a maiden ADAC GT Masters victory, championship leaders Luca Ludwig (26, DEU) and Sebastian Asch (29, DEU, both Team Zakspeed) had the massively frustrating experience of parking up their Mercedes-Benz SLS AMG on the first lap after a contact with a competitor. Their closest pursuer, Dominik Baumann (22, AUT), ably assisted by DTM star Bruno Spengler (32, CAN, both BMW Sports Trophy Team Schubert) this weekend, finished fourth and reduced the deficit on the current leaders by twelve points ahead of the last race of the season on Sunday. For Frey, Geipel and YACO, the satisfaction with their first win in the series on this pleasant autumn day was immense. 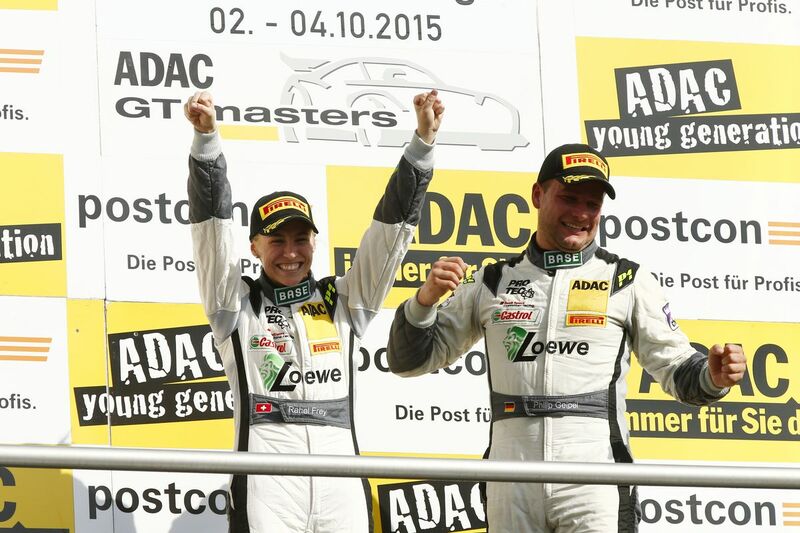 “Today is a real holiday for us, in keeping with today´s 25th Day of German Unity, because a team from Saxony has won the ADAC GT Masters for the first time,” beamed Geipel. The final race on Sunday to decide all three titles will be shown live on SPORT1. Coverage starts at 13:00 CEST. The penultimate race of the season began with a scare. After an accident involving newcomer Nicklas Mackschin (20, DEU, BMW Sports Trophy Team Schubert) in one of the BMW Z4s, the red flag was shown to halt the race. Mackschin was unhurt and able to free himself from the wrecked vehicle. There was then a worrying moment for championship leader Asch and rival title contender Bachler (24, AUT, GW IT Racing Team Schütz Motorsport). On the second corner, Asch collided with the Porsche 911 driven by Bachler’s team-mate Christian Engelhart (28, DEU). Neither the Mercedes-Benz nor the Porsche was able to continue the race. While Asch and Ludwig have a second chance to clinch the title in the final race on Sunday, Bachler saw his own aspirations blown away by the incident, as he now no longer has even a mathematical chance of finishing top of the table. After a short interruption, the race was continued, with the new duration being set at 50 minutes. Pole-sitter Luca Stolz (20, DEU, Bentley Team HTP) in his Bentley Continental pulled smartly away from Rahel Frey’s Audi and the Ford driven by Nico Verdonck (29, BEL, Lambda Performance). However, the Bentley’s spell in the lead was to last only another four laps, at which point Stolz ground to a halt, having lost all power, allowing Frey to inherit the lead. Despite coming under severe pressure from Verdonck, the Swiss driver kept a cool head. The pit stop then gave the Audi team additional breathing space, because while the Ford team were losing five seconds, the handover from Frey to Geipel went very smoothly. With Ford taking so long to change drivers, Fabian Hamprecht (20, DEU) in the second Bentley now took over as main pursuer, but he was unable to get within striking distance of Geipel and had to settle for the runner-up spot which he shared with co-driver Clemens Schmid (25, AUT, both Bentley Team HTP). In the battle for P3, the Audi R8 pairing of Stefan Wackerbauer (19, DEU) and Kelvin van der Linde (19, RSA, both C.Abt Racing) prevailed against the BMW duo of Baumann and Spengler. P4 was enough for Baumann to reduce the deficit to 19 points going into the final race. By the end of an action-packed race, Andreas Wirth (30, DEU) and Daniel Keilwitz (26, DEU, both Callaway Competition) in their Corvette had battled their way up into P5. Verdonck and team-mate Frank Kechele (29, DEU) in the Ford GT finished the race in seventh place behind the Audi R8 of Edward Sandström (36, SWE) and Daniel Dobitsch (31, AUT/kfzteile24 MS Racing). Jordan Lee Pepper (19, RSA) and Nicki Thiim (26, DEN, both C.Abt Racing) finished eighth in yet another Audi R8. The title decision in the Gentlemen class was also postponed until Sunday. Marc Gassner (24, DEU) in the Nissan GT-R finished ninth overall along with Florian Strauss (30, DEU, both MRS GT-Racing) and thus secured his third class victory ahead of championship leader Andreas Weishaupt (42, DEU, C.Abt Racing) whose Audi R8 crossed the finish line in second place in the Gentlemen class and tenth overall with partner Christer Jöns (28, DEU). The chase for the team title is still undecided. BMW Sports Trophy Team Schubert and Team Zakspeed are level on points in P1 going into the final race. Only the BMW and Mercedes-Benz outfits still have a chance of winning the team standings in the final race on Sunday. Championship leader Ludwig starts into Sunday´s race with a handicap. After Saturday´s race, Asch was penalised with a drop of the positions for Sundays race for avoidable contact with the Porsche at the start of race 1. Thus, his teammate Ludwig will start from fifth into the final race of the season. Ford man Kechele and Sandström in an Audi will share the front row, while title contender Baumann will start from sixth position. Previous : Formule Renault 2.0 NEC – Delétraz nearly there!